Outside of watching or listening to media on the iPad, using the iPad in the office is about being able to access work files and note taking. We cover and will continue to cover note taking solutions, this post is about always having everything you need in meetings. The trick of the process is converting everything to the PDF format. Save or ‘print to’ emails, documents and PowerPoints to PDF. While it is possible to load those documents to your iPad via a sync, it is better to work through a cloud solution so you can have access to new versions of documents and send/receive from anywhere you have Internet access. 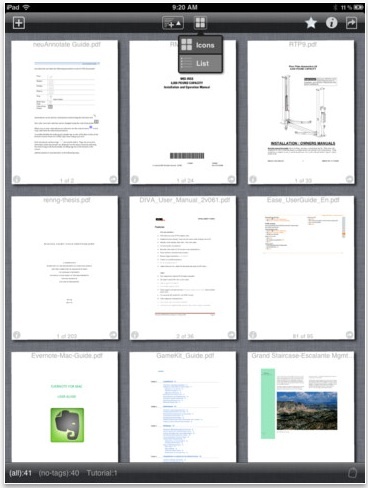 We have been using GoodReader on the iPad for the management of these documents since it was released. An update the developers released allowing for the creation of folders and moving files between them has proven important as the quantity of documents has grown. 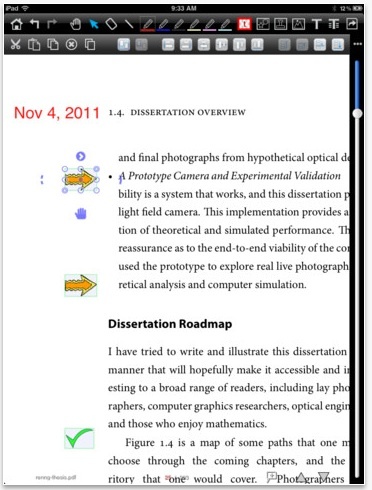 Annotation of those PDFs have become more and more important also. Having a PowerPoint on the iPad as a PDF, means the formatting is saved, then write notes and comments right on the pages. A addition to the iPad PDF management group we are working with right now is neu.Annotate. It allows the basics we must have; moving files between Dropbox, freehand writing on the PDF files, ‘stamps’ like pointers, rotating pages, pasting a image into a PDF… adding and delete pages is a nice extra. Neu.Annotate Plus also offers a list of features that gives us more power over our work PDFs around the office. Thumbnail view makes our files management more like we are used to with paper on our physical desks. An interesting feature of moving elements around might prove to be handy when looking at documents that were previously un-editable.